Blue Harbor is a premier senior living management company who truly cares about the residents that live among its communities. Blue Harbor knew it needed a strong digital presence to stay competitive in the fast-growing market. The decision to move yourself or a parent to a senior living community can often be emotionally taxing. We wanted to ensure that Blue Harbor's new website eased the pain and guilt that can accompany that decision by showing the Blue Harbor difference through people-focused content and imagery. In an industry where everyone cares, we set Blue Harbor apart by emphasizing that message through new photography and content, using real community residents and real life moments. In addition to an overhaul of their corporate web presence, we were also faced with another challenge. Blue Harbor has 27 (and counting) unique senior living communities throughout the United States. 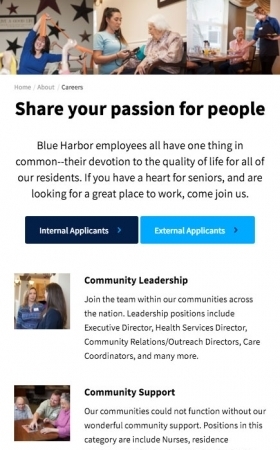 In order for Blue Harbor to truly have a robust presence online, each of their communities also needed a new website. We designed and built a custom theme tailored to Blue Harbor and run on FourSite, thus providing a scalable solution that will grow with their needs. To achieve the strategic objectives laid out, we knew that we couldn't just rely on stock imagery or exterior photos to convey the vibrant life at a Blue Harbor community. We art directed a photo shoot at a Blue Harbor community and wrote the website copy to make sure all aspects of the site worked together to meet Blue Harbor's goals. We also created an aesthetic that could scale to Blue Harbor's many communities. Moving a loved one into a senior living community can be an emotional experience. With Blue Harbor's new site, we wanted to create a website for families that was easy-to-use and felt friendly, inviting, and warm. Furthermore, we've provided additional opportunities for lead generation and enhanced SEO opportunities, giving users more avenues to learn about and contact Blue Harbor while also meeting the client's business goals. 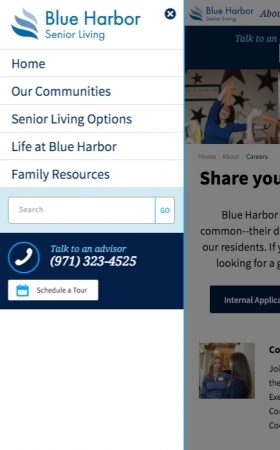 The mobile homepage still needed to allow the user to easily call or contact Blue Harbor in addition to finding a specific community. 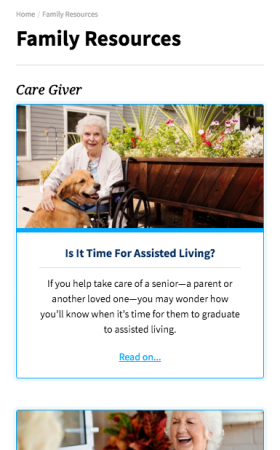 Our inbound team provided targeted content, including helpful family and caregiver resources. 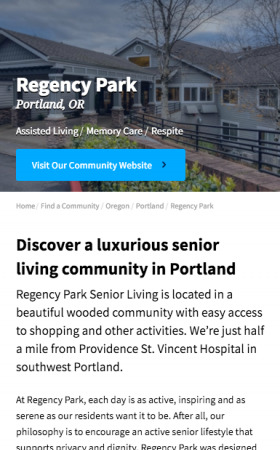 Community landing pages were improved to include more useful information, including amenities, photos, and reviews. The corporate Blue Harbor site is the place all potential Blue Harbor employees visit to learn about the company. 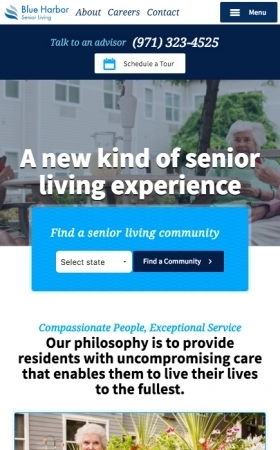 Like what we did for Blue Harbor Senior Living?